The Nativity of Our Most Holy Lady Theotokos and Ever Virgin Mary: The Most Holy Virgin Mary was born at a time when people had reached such a degree of moral decay that it seemed altogether impossible to restore them. People often said that God must come into the world to restore faith and not permit the ruin of mankind. The Son of God chose to take on human nature for the salvation of mankind, and chose as His Mother the All-Pure Virgin Mary, who alone was worthy to give birth to the Source of purity and holiness. The Nativity of Our Most Holy Lady Theotokos and Ever Virgin Mary is celebrated by the Church as a day of universal joy. Within the context of the Old and the New Testaments, the Most Blessed Virgin Mary was born on this radiant day, having been chosen before the ages by Divine Providence to bring about the Mystery of the Incarnation of the Word of God. She is revealed as the Mother of the Savior of the World, Our Lord Jesus Christ. The Most Holy Virgin Mary was born in the small city of Galilee, Nazareth. Her parents were Righteous Joachim of the tribe of the Prophet-King David, and Anna from the tribe of the First Priest Aaron. The couple was without child, since St Anna was barren. Having reached old age, Joachim and Anna did not lose hope in God's mercy. They had strong faith that for God everything is possible, and that He would be able to overcome the barrenness of Anna even in her old age, as He had once overcame the barrenness of Sarah, spouse of the Patriarch Abraham. Sts Joachim and Anna vowed to dedicate the child which the Lord might give them, to the service of God in the Temple. Childlessness was considered among the Hebrew nation as a Divine punishment for sin, and therefore the righteous Sts Joachim and Anna had to endure abuse from their own countrymen. On one of the feastdays at the Temple in Jerusalem the elderly Joachim brought his sacrifice to offer to God, but the High Priest would not accept it, considering him to be unworthy since he was childless. St Joachim in deep grief went into the wilderness, and there he prayed with tears to the Lord for a child. St Anna wept bitterly when she learned what had happened at the Jerusalem Temple. Never once did she complain against the Lord, but rather she prayed to ask God's mercy on her family. The Lord fulfilled her petitions when the pious couple had attained to extreme old age and prepared themselves by virtuous life for a sublime calling: to be the parents of the Most Holy Virgin Mary, the future Mother of the Lord Jesus Christ. The Archangel Gabriel brought Joachim and Anna the joyous message that their prayers were heard by God, and of them would be born a most blessed daughter Mary, through Whom would come the Salvation of all the World. The Most Holy Virgin Mary surpassed in purity and virtue not only all mankind, but also the angels. She was manifest as the living Temple of God, so the Church sings in its festal hymns: "the East Gate... bringing Christ into the world for the salvation of our souls" (2nd Stikhera on "Lord, I Have Cried", Tone 6). The Nativity of the Theotokos marks the change of the times when the great and comforting promises of God for the salvation of the human race from slavery to the devil are about to be fulfilled. This event has brought to earth the grace of the Kingdom of God, a Kingdom of Truth, piety, virtue and everlasting life. The Theotokos is revealed to all of us by grace as a merciful Intercessor and Mother, to Whom we have recourse with filial devotion. Has shone from You, O Theotokos! 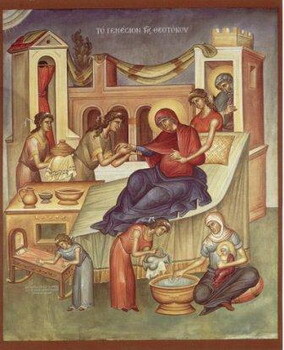 The barren woman gives birth to the Theotokos, the nourisher of our life!